Mussanah to Muscat ~ Tears and cheers for all! Today brisk downwind conditions, took the full fleet of nine Farr 30s home to The Wave, Muscat, providing the perfect conclusion to this year’s tour. The fleet, leaving Mussanah Marina at dawn this morning, was up to its full strength with the return of Adil Khaled and his Team Abu Dhabi, following their grounding and helicopter rescue on leg two. A fitting end to the event was that honors on the leg should go to French America’s Cup helmsman Bertrand Pacé and the crew of AISM, who have constantly dominated EFG Bank Sailing Arabia The Tour 2013. Over the last two and a half weeks they have won five of the seven offshore legs, and set the tone for the in-ports when they claimed three out of three races in Doha. AISM won 2013 SATT by 10.25 points. Starlets of the show, regardless of where in the GCC they visited, have been Rising Tide Leadership Institute Ambassador Dee Caffari’s all-female crew on Al-Thuraya Bank Muscat. Almost speechless with disappointment, hiding behind her sunglasses, was Al-Thuraya’s Intisar Al-Tobi. “I am sad, because we were so close and we did our best, and we tried so hard to finish in the top three places,” she said. 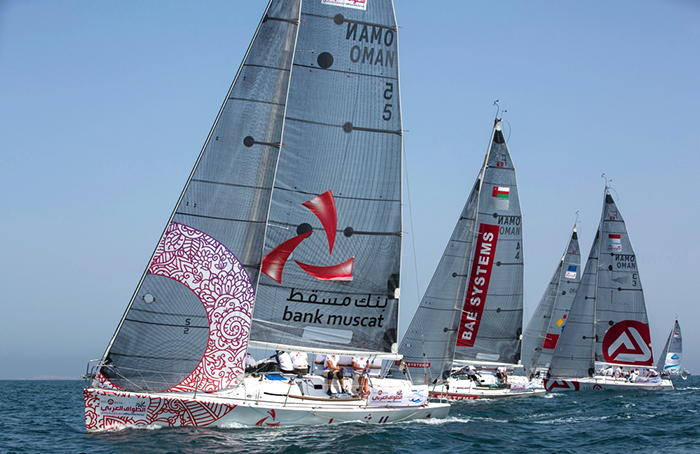 Taking in four countries and eight ports of call, EFG Bank Sailing Arabia The Tour (SATT) is a showcase of everything that the Gulf has to offer in terms of state-of-the-art facilities, and idyllic sailing conditions. Leaving Manama on February 10th, EFG Bank SATT calls at Doha, Abu Dhabi, Dubai, Ras Al Khaimah, Dibba and Mussanah, ending February 25th in Muscat.